Shawn Diamond has been quietly making news the past few years with multiple V14 boulder problems and 5.14 redpoints to his name. Earlier this month he climbed “the purest line” on the impeccable Grandma Peabody boulder at the Buttermilks by climbing his Direction (V13) into Jeff Sillcox’s direct finish to the boulder Magnetic North (V9/10) to create a V14 he dubbed True North. Diamond later changed the name to Direct North after learning that Sean McColl had used the name True North for one of his variations on Grandma Peabody that linked Baburre into Direction. Tell us what have you been up to lately in California? For the past month, I’ve been living back at home with mom mostly studying for the United States Medical Licensing Exam, USMLE. I’m not quite sure which was harder – memorizing textbooks full of medicine or enduring mom’s household as a 26 year old and independent dude. The horror of having to explain late nights out of the house has gotten SUPER old! But, in between reading and oatmeal with mom, I’ve been traveling around Southern California and Bishop before it got too hot playing on rocks. Mainly, I’ve been psyched to put up FA’s, the scarier the better. A few of your recent lines have been link-ups on the amazing Grandma Peabody boulder at the Buttermilks. For those that have never seen this boulder, can you explain a little bit what these problems are like (i.e. – are these new lines contrived or are they a bit more logical (and cooler) than they might appear to an outside observer)? When I was in college at UCLA, I traveled up to Bishop every weekend and started finding new lines to squeeze into the Grandma face. When I first started bouldering at the Buttermilks the only problem that was on the middle of the grandma face was Center Direct and Thunderbird. Wills Young had told me that a SDS to Thunderbird had been eyed and tried by Tim Clifford and other strong climbers. I focused on sending that line first which turned into Direction. Along the way toward that First Ascent, I saw holds arching up and right toward the Grandma Peabody finish. So I started playing on another one of my “to-be” lines The Mystery V12. After I did the Mystery, I figured that no one else would either find where it was or where it would go – hence the name. Luckily, with Wills’ help and some guidebook exposure the Mystery has turned into a Must Do problem and this year got its first and much heard of FFA by Alex Johnson! Direction finally fell late in the winter of 05 and has seen many repeats – clocking in at V13. But, the line unfortunately bailed to the left quickly after its crux moves – finding jugs and a simple finish to the top of the boulder. Last year, Jeff Silicox climbed into the top of Direction from jugs out left and added a straight up finish, Magnetic North V9, that I never was able to picture before. The V9 finish takes on large moves between small patina crimps way off the deck and requires a tenuous healhook at the last crux. If that heal should blow, take care of your fragile head that comes spinning to the ground! This past winter was an epic. Never before have I been so committed and psyched to climb new and scary lines. Piecing together Direction and Magnetic North had to wait until I completed Luminance, the first ropeless ascent of the Golden Rule V4X and the first* ground up of Footsteps V9X….But, eventually I had the time and the motivation to get away from home in Los Angeles to finish up business on the Grandma. I wish I had had the vision four years ago to send Direction and finish straight up and all this confusion would be done away with, but it is truly the most proper route on the boulder. From sit to top Direct North v14?R/X follows the most direct and obvious line without any rests going from V13 to V9 without any potential to shake and chalk. It’s 15 moves of squeezing for life!! Related to that last question, since a lot of people have focused on putting up new variations on the Grandma Peabody boulder does that mean there are no prospects for super hard problems elsewhere in the Buttermilks, or is it something else? Absolutely not!!!! The buttermilks are RIDICULUOUS…there’s future lines there for decades to come. 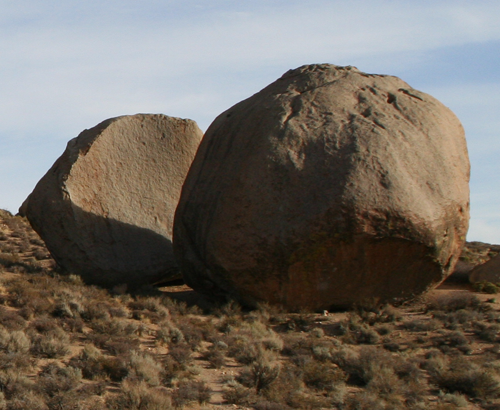 HUGE, titanic size boulders lie by there lonesome all year. I’ve seen boulders in the Bardini’s that look like huge ship bottoms with massive 45’s, roofs, arêtes and granite features that wait for the future. I focused on finishing this line in particular because it’s the most pure line on the boulder and the hardest, but, for example, I have zero motivation to go back and repeat any of Sean McColl’s traverses into either Direct North or Magnetic north. Doing FA’s on completely new boulders requires enormous amounts of motivation, energy and a crew willing to do the same. It is much much easier to stay by the roadside along with climbing partners in order to put up more and more variations on the same boulders. It takes some true cowboy grit to get out into the wilderness, explore, scope, envision and execute the wonder lines! Did you have a chance to try out the Rastaman Vibration SDS project (likely V15) at all during your time in Bishop? Indoor bouldering comps have been all the rage lately yet I don’t believe I’ve seen your name on any of the running orders, do you have any interest in competing? Hypothetically yes. But practically NO. I did a comp last year in New Jersey like two hours after taking an Anatomy exam that I had stressed all week about. I got crushed and climbed miserably. Worse than that, I was such a sore sport. Really whiny, mopey and lame. I used to compete and climbed in World Cups abroad….right now I’m way more psyched for adventures and highballs!!!!! They’re a little bit secret, but I’ll give you some hints. Check out Ansel Adams photography in the Sierra Nevada and Sequoia. Pick out the biggest most badass cliffs and boulders in those images…..they’re gonna get sent ground up, no pad, no ropes with Damon Corso to capture All the excitement!!!! Thanks to Shawn for the interview! You can read more in this story Diamond wrote for the Five Ten Blog. *According to Wills Young in the comments, George Ullrich did the first ground up ascent in the summer of 2008 which would have been prior to Shawn’s ascent. props to going into the old school photos of Ansel Adams instead of just sharma-ing it and taking a helicopter to search out of reach areas. narc great to see all these updates!!!! Not reported on my site, but George Ullrich actually did the first ground up ascent of Footprints in summer 08, which was also the second ascent. Thanks for the update Wills, I’ll make a note of that. Wait, is he saying that he stuck the crux move on what is now Lucid Dreaming, only to fall off afterward? In the section that Paul Robinson campuses through in the Reel Rock footage? Good question. At the time I wasn’t that familiar with the problem so it didn’t stand out when he said that.